IPOC (Integrated Plate boundary Observatory Chile, www.ipoc-network.org) is a European-South American network of institutions and scientists organizing and operating a distributed system of instruments and projects dedicated to the study of earthquakes and deformation at the continental margin of Chile. Map: A key component of IPOC are its multi-parameter observatories, where at the same site a suite of different physical parameters are measured continuously. 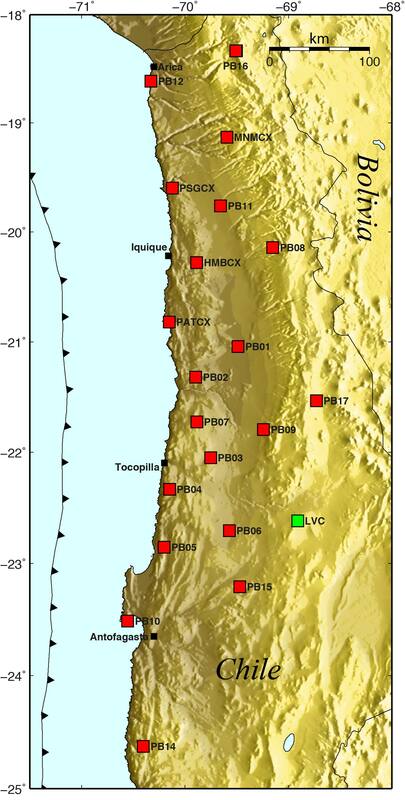 So far 20 such stations are installed across the forearc of central Chile. All sites are equipped with STS-2 broadband seismometers and accelerometers. Additional instrumentation includes continuous GPS, electric and magnetic field (MT), surface inclination, and climate (temperature, air pressure, humidity). Most sites transmit their data in near-real time to the scientific community. Worldwide occurrence of Earthquakes during the last 14 days provided by the Geofon Earthquake Monitor. Click the map below to look at the latest Earthquakes. 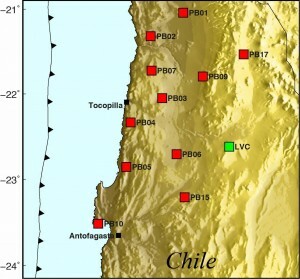 Time animated aftershock series for the Mw 7.7 2007 Northern Chile earthquake (Schurr et al., 2012, doi:10.1029/2011JB009030). 0.5 m slip contour lines and main shock epicenter are also plotted. The aftershocks quickly fill the region that slipped during the mainshock, hinting that accumulated stress was not completely relaxed during the mainshock. Such a pattern is an indication that the rupture surface is “rough”, i.e. 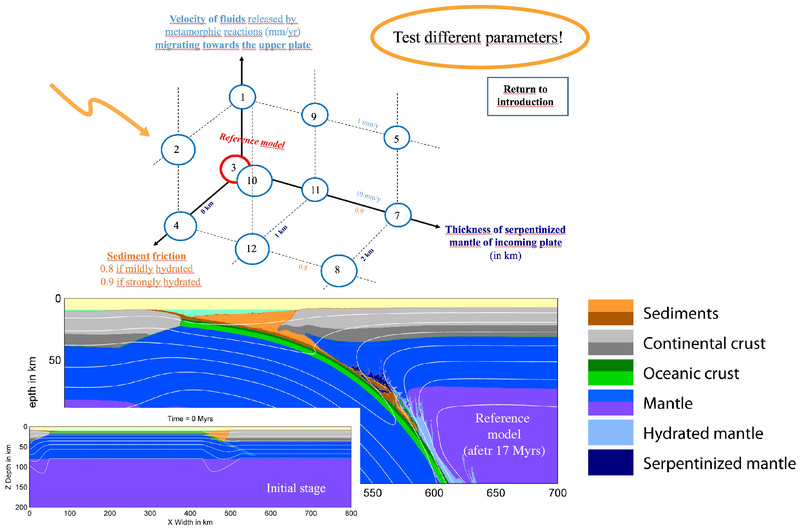 has heterogeneous frictional properties, a characteristic that is quite typical for the deepest part of the megathrust seismogenic zone, where these earthquakes occurred.